Now Smell This used to send out daily emails so readers would know what new posts had appeared here. We stopped doing that in early 2014, and at that time I recommended a couple email services as possible replacements. One of those, FeedMyInbox, is apparently not working for everyone lately, so here are a few alternatives. If you're using a wonderful app or newsreader we might not know about, do comment! Blogtrottr is the same kind of service as FeedMyInbox: it sends emails letting you know when a blog has been updated. You can choose how often you want to be notified. I tested the "4 hour digest" option and it appears to work fine (you can also pick anything from "real time" to "daily digest"). There are a few ads in the email, but I did not find them intrusive. Feed Notifier is a simple application that sits in your system tray on Windows or MAC and lets you know when new articles are posted on whatever blogs (or other news sources) you follow: "Feed Notifier is an application for Windows and Mac OS X that resides in the system tray or status bar and displays pop-up notifications on your desktop when new items arrive in your subscribed RSS or Atom feeds." The pop up is shown above. It's pretty simple, and if you click on the title, you're sent directly to the article. I have tested it in Windows on my ancient desktop and my reasonably new laptop, it seems to work fine. Feedly is a news reader (or RSS aggregator). If you sign up for Feedly, you specify what blogs and other news sources you want to follow, and then you can either load the Feedly web page in a browser or use their mobile app to check your news. 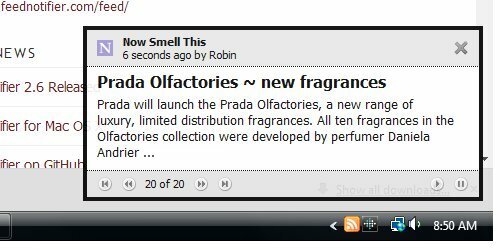 You can organize your sources by topic — for instance, you could put all your perfume blogs in one category and check it every so often to see what's been posted on your favorite sites. I keep Feedly open in my Chrome browser all the time, "pinned" over to the side, and I go to that tab when I want to see what's been posted. I also have the Feedly app on my iPhone and my iPad. What if you don't want to have to check Feedly, or keep a tab open for it in your browser? You can try Feedly Notifier. The Feedly Notifier extension is available in Chrome, Safari and Firefox. It adds a small icon (and, if you like, a sound notification) at the top of the browser to let you know when you have unread articles in Feedly (so yes, you have to have a Feedly account before you can use Feedly Notifier). The icon tells you how many unread articles you have, or how many in a specific category, and yes, you can make a single blog its own category. You can also set the app to show a pop up when you click on it, so that essentially, you need never load Feedly itself at all. The image above shows the Feedly Notifier app in my Chrome browser. The red number 1 next to the icon tells me I have 1 unread article; when I click on it, I get the pop up that shows me the article title. If you click on the article title, you're taken directly to the article. The Feedly Notifier works as expected in Chrome; I have not tested it in Firefox or Safari. Boxcar will push a notification to your iPhone in a variety of instances, including new items in an RSS feed. It has good reviews but I have not tested it. Similar apps include Pushbullet and Hooks, and there are many more — try searching for "rss notifier" or something like. How awesome of you Robin. Thanks for putting so much effort into this- much appreciated. So glad if it’s helpful! Very helpful, Robin. I miss the daily emails from NST. They always brightened my workday. I liked them too — it was a quick way to know my feed was functioning properly. Plus, I thought it looked nicer than any of these other options. But don’t have a way to bring them back. It’s cool. I see it has not stopped me from checking the website daily, sometimes throughout the day, to get my perfume fix so my dedication has not waivered in the least. I’m a fan of Feedly. It works reliably for me. I usually read via a news reader (The Old Reader) but the NST feed is showing as inactive since August 2015. Is there an alternative RSS feed address? and see that it is up to date (it’s easiest to read in Firefox, but it works in any browser). Someone else complained recently, and she was using NetNewsWire, and likewise her problem started back in August. It is possible that there was some sort of glitch in the feed back then and your reader has never cleared / reset, so you also could try contacting them to see if they will reset? But NetNewsWire swore the problem was on my end, not theirs. I don’t see how that can be given that Feedly is working, but even if it’s true I’m not sure how to fix. Thanks for the reply, I’ll try one of the alternatives way to view that you suggested. Great. In case the above was not clear — I use the news reader Feedly, and I check my posts there every day. It has been working all along.